...so can you really tell your friends your life is bongomatik...? Jazz? Pop? Latin? Funk? …BONGOMATIK ! The debut album was released in 2011 and generated a lot of attention with a hit in the Colombian charts, airplay, great reviews, and a nomination for ‘Video of the Year’ for the Jazz Journalists Association Awards. 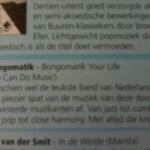 November 2013 the second album ‘Bongomatik Your Life’ was released. On this new album you can hear how Bongomatik has evolved in a mature way. 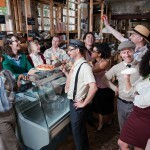 The 13 original compositions each have a fresh new sound and have a strong live feel. All the tracks were recorded live in the studio by the entire rhythm section. No overdubs on solo’s and tricky bits: what you hear is what you get. In 2016 they recorded their third album, Espanderland, that will be released on CD as well as on Vinyl in autumn this year. 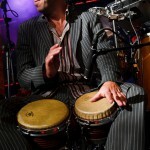 So stay tuned for some new funky, latin, bongomatik music. Bongomatik is not only the name of this band; it’s just the best way to describe their music. Festivals: Dunya festival, De Parade, Pole Pole, Gentse Feesten, Young Arts Festival, Jazz in Duketown, Dias Latinos, Schelde-Jazz, Afro-Latino Festival, Totaal Festival, De Karavaan, Swingin’ Groningen, Jazz at the Hop, Jazz bij Duurstede, Breda Jazz Festival, etc. 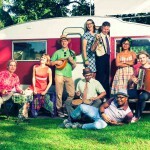 Venues: Bimhuis, North Sea Jazz Club, De Doelen, Prospero, DJS, Dizzy, Meterhuis, Rotown, het Paard, etc. Season ‘12/’13 Bongomatik had a theatre-tour with the program ‘Bongomatik Jazzbits Night’.